Energy efficiency is great for a couple reasons. The first is that it saves you a lot of money in energy bills every month, and who doesn’t want that? The second is that the less energy you consume, the better off the environment is. Whether you’re renovating your current home or building a brand new one, there are some things you can do to make it incredibly energy efficient. If you have the opportunity to take advantage of modular construction in your add-on, new build, or renovation, you should definitely consider it. Modularly constructed structures are built offsite in a factory and then shipped and assembled onsite. Not only does this make the building process much quicker, it reduces a lot of waste, too. Modular construction also reduces energy consumption during the building process by roughly 67%, and it reduces energy costs later on for the occupants. Your HVAC equipment is there to help you stay comfortable in your home; it keeps you cool in the summer and warm in the winter. You get to set the temperature yourself, and you may not think a few degrees make a difference in your bills, but they do. The Department of Energy states that if you set your thermostat back by seven to 10 degrees for eight hours a day, it can help you save as much as 10% a year on your heating and cooling bills. You’ve already thought about landscaping because you want to have a nice looking yard, but what does that have to do with your energy bills? Well, proper landscaping can actually help you save money on cooling in the summer because trees and brushes can stop the sun from coming into your house and heating up the interior. In fact, landscaping can reduce air conditioning by up to 50% by shading the windows and walls of a home, according to the American Public Power Association. You might be confused again because you always thought carpets were better for energy purposes. While carpets are better at retaining heat compared to hardwood floors, they’re better at retaining dirt and dust, too. For example, even the best vacuums on the market can only pick up about 15% of the dirt in your carpet. You’ll waste energy running the vacuum cleaner all the time, and the extra dust in the air can clog up your HVAC system. This will make it work harder to regulate the temperature in your home, costing you more money. You have to use your water for a lot of things, but you don’t have to be wasting water. The U.S. Environmental Protection Agency (EPA) reports that the average homeowner can save $170 a year with small changes to their water usage. Don’t run the water while you’re brushing your teeth or shaving. Also, change the way you bathe. Taking a bath uses 75 gallons of water, whereas a shower only takes 17.2 gallons on average. You’ve probably heard about the many benefits of LED light bulbs compared to conventional bulbs. LED bulbs give off a lot more light, and they consume less energy. Plus, they last 20 times longer on average, saving you a lot of money in the long run. You like hot water just as much as the next person. No one likes taking a cold shower, and that’s understandable. You don’t really need to turn your water heater up higher than it needs to be, though. You should set the water heater between 120 degrees Fahrenheit and 130 degrees Fahrenheit. If you set it higher than that, your heater will be running more often to heat your water, which will raise your energy bills. Finally, you can create a home with energy efficient windows to save on your energy bills every month. It typically only costs $15 per window more to purchase Energy Star-rated windows, and that can save you a ton of money in the long run. They retain the interior temperature much more efficiently compared to other windows, giving your HVAC system a break. If you want to save some money and the environment at the same time, think about some of these tricks. The next time you upgrade your home, or even build a new one, don’t forget about energy. During the frigid winter months, many homeowners struggle to strike that seemingly impossible balance between staying warm without seeing a spike in utility costs. However, there are a number of effective ways to feel cozy in your home this winter while investing in its future value as well. Here are just a few ways to save money on utility expenses and keep you and your family warm all winter long. While most homeowners are aware of the heat lost through cracks in windows and doors, most remain in the dark about the significant amount of heat lost through a home’s attic. Adding layers of fiberglass insulation is one of the best cost-effective solutions and can help retain more of your home’s heat. “The obvious place to add insulation is the attic, but also consider the crawl space, garage and basement. If you’re doing any construction that opens up exterior walls, that’s a good time to add insulation in the walls,” writes Teresa Mears in U.S. News. If you’re not sure exactly how much heat is disappearing through your home’s attic, check to see when it was last insulated. If it’s been more than about 20 years, it’s definitely time for a new layer. Heating and cooling account for about 48% of the energy use in a typical U.S. home, and your furnace works just as hard to cool your home during the winter as your air conditioner does to cool your home during the summer. That means that without timely filter changes and occasional inspections, your entire HVAC system will plummet in efficiency. 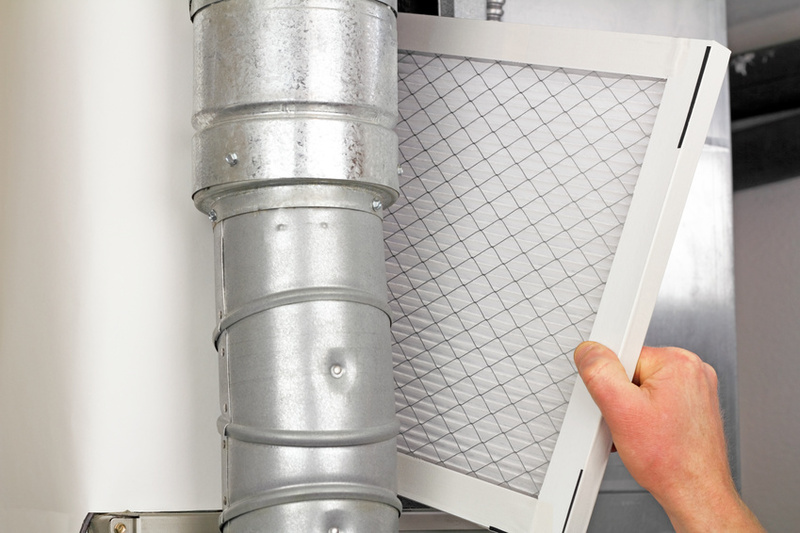 A furnace with a dirty filter has to work harder to achieve the same output, and an overworked furnace is more likely to break down just when you need it most. When it comes down to it, the U.S. Department of Energy estimates that adequately maintained furnaces can save you a little over $30 a month versus their neglected counterparts. Of course, if your furnace is more than nine or 10 years old, you may want to consider replacing it entirely. Modern furnaces are generally much more efficient, and they’re also a major selling point for the eco-conscious home-buyer. But most of all, you’ll have the security of knowing that your new system won’t break down and leave your family in the cold during a snowstorm. Finally, take some time to consider some larger energy-saving home improvement projects that may be opportune when spring arrives. For example, simply choosing the right roofing material could result in as much as a 30% decrease in your home’s energy needs, and if your home’s roof is more than 15 years old, there’s a good chance it’s time to get it replaced. Ultimately, it’s up to you as a homeowner to decide what’s best for both your home and your family. But being conscious of the simple ways you can reduce your home’s energy costs is the key to finding that elusive balance between cost and comfort.